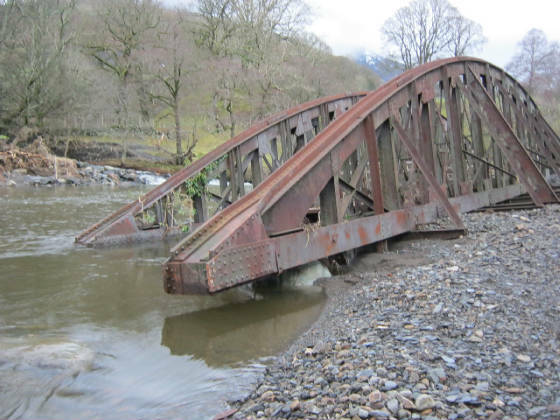 Over the weekend of 5th and 6th of December 2015, unprecedented floods swept 2 bridges off their abutments between Keswick and Threlkeld. A section of trackbed was also washed out where the river became unusually swollen and changed course. 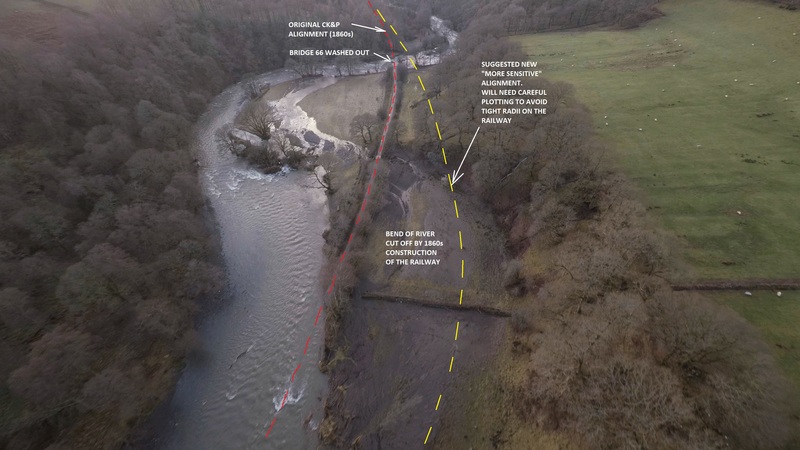 The Lake District National Park Authority (LDNPA) and Sustrans are keen to re-open the path between Keswick and Threlkeld as soon as possible. Loss of the route is affecting business such as accommodation providers, cycle hire, pubs and outdoor shops at both ends. CKP Railways plc has had discussions with LDNPA management on ways to recover the situation with quick fixes that would not compromise re-ienstatement of railway bridges later. The LDNPA has policies in place to protect the route for future sustainable transport use. Bridge No. 66 (Low Pearson), a dual span bridge east of Briery was completely destroyed. 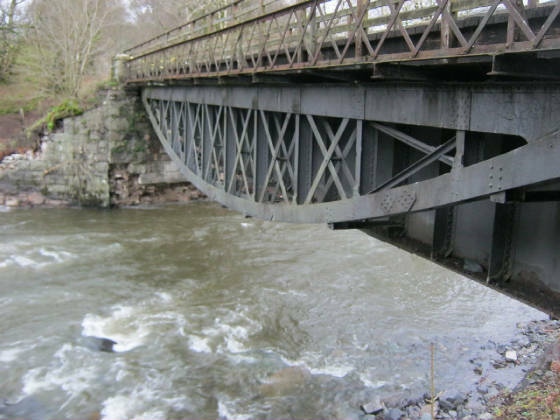 The masonry pier in the middle of the river was torn apart and the girders carrying the bridge deck ended up as a kit of parts on the river bed downstream. Bridge No. 71 (Brudnholme) was swept off its abutments and came to rest on a new bank of debris in the river. 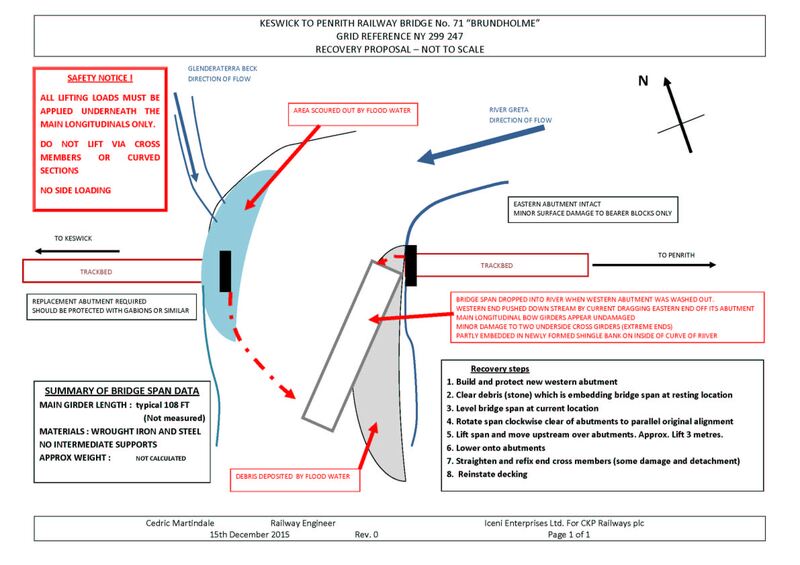 CKP Railways plc believed that this bridge can be re-instated and provided suggestions on a method of recovery. The bridge was, however, broken up on site without any consultation. This was thought to have been done at the request of the Environment Agency. Bridge No. 73 (Rawsome) has suffered damage to the western abutment. It is currently closed until a full assessment and repairs can be carried out. 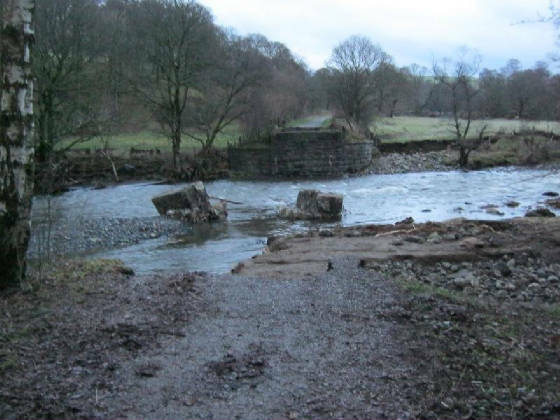 Approximately 200 metres of trackbed was washed out near Brundholme Woods. The embankment built in the 1860s restricted a natural bend in the river and was, therefore, always vulnerable. CKP Railways has suggested a more sensitive alignment for a replacement route. Click here to go to the LDNPA webpage about the path reconnection. information or suggestions about recovery of the route. Many people suffered more personal and even life-threatening inundations.